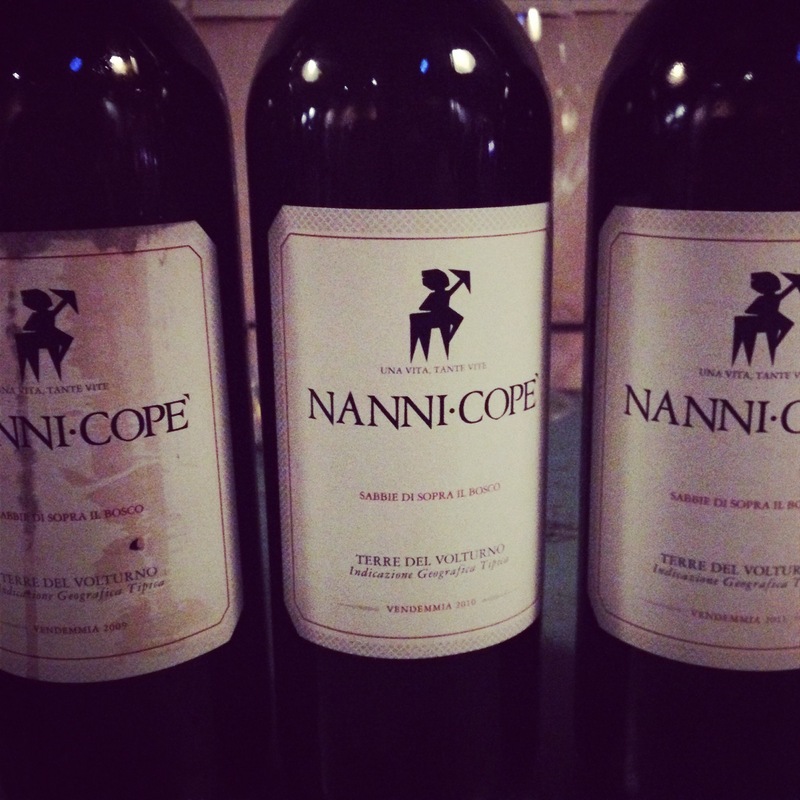 Three vintages of Nanni-Cope last night. Last night my Italian wine tasting group (this group is made up of mainly other imports, wine merchants and journalists with an interest in Italian wine) looked at around 15 whites and reds from Basilicata and Campania. Whilst there was lot’s of good wines, there was also lot’s of examples of over use of oak and obvious winemaking faults. There were though, lot’s of really good wines and this bracket featuring the 2009, 2010 and 2011 vintages of Nanni-Cope were outstanding. 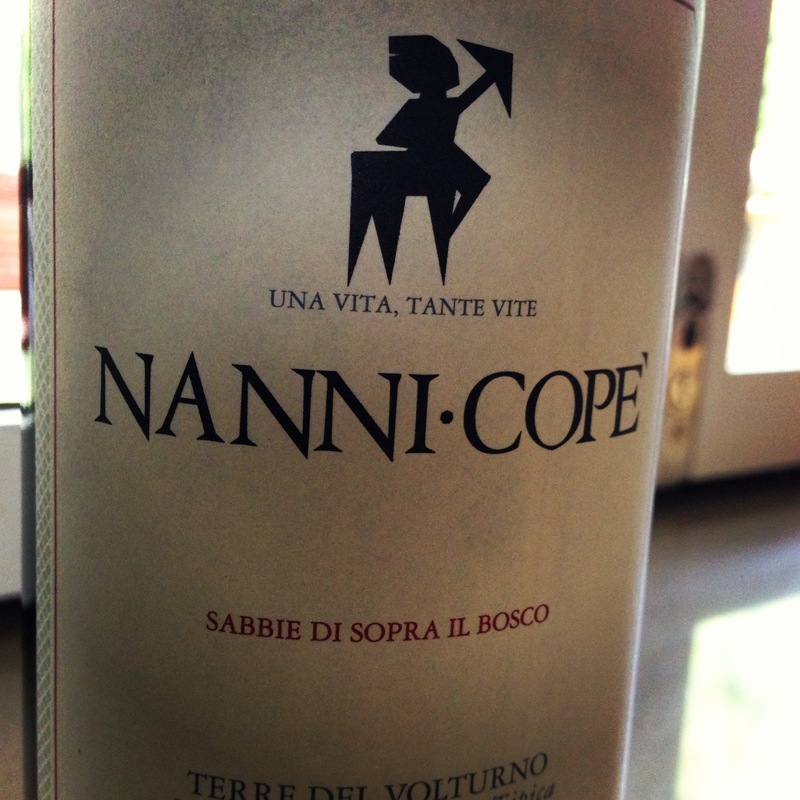 For those of you that are not familiar with Nanni-Cope, you should be. These are truly amazing wines. Below is some background information on the wines and winery. Giovanni Ascione, whose childhood nickname was Nanni Copé, founded the Azienda Agricola Nanni Copé in 2007. The wine is the fruit of his inner passion for wine, as well as of his encounter with a unique vineyard at Castel Campagnano, in the upper region of Caserta, Campania. It is a beautiful, unpolluted area, with vineyards alternating with woods. The Taburno and the Matese massifs are nearby, the sea is about thirty kilometres away, and the middle course of the Volturno river flows in the neighbourhood. Vigna Sopra il Bosco spreads over a 6.2 acres surface at about 700 feet above sea level, mainly exposed to the north-west. The plants are aged over twenty years on average. Giovanni’s guiding philosophy reflects the inner power of a wine from the south, expressed in a northern style. Trying to enhance the extraordinary qualities of the Pallagrello Nero through the exaltation of the utmost elegance and drinkability. Never concentrated, neither in the vineyards nor in the cellar. A maximum expression of the terroir. Vigna Sopra il Bosco is a true obsession. The plants are registered one by one and the whole vineyard is divided into sectors subject to different pruning, foliage management, surface management, and harvesting approaches. 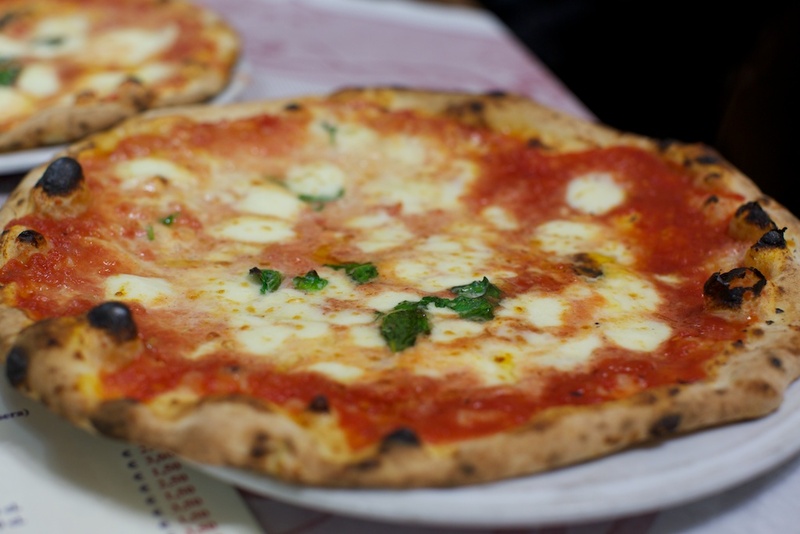 See Naples and die: for Pizza Margherita…..
Over the last six years I have been to all part of Italy at least once and sometimes twice a year. Italy is so diverse and different from region to region and town to town. Once city that has been high on my bucket list is Naples: and for me everyone should visit Naples at least once in their lives. 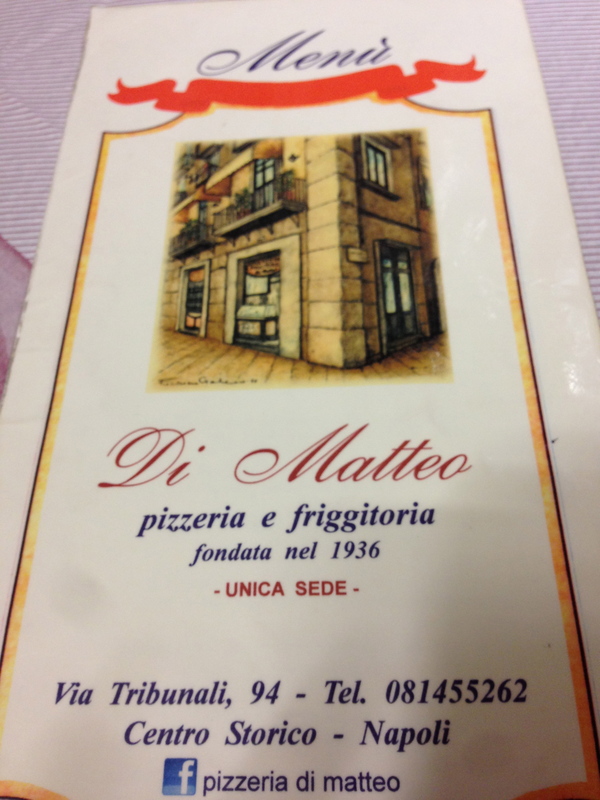 This year, the opportunity to stay in Naples for one night whilst we visited our Campanian producer Salvatore Molietierri was quickly embraced and last night Stefano, my good friend Matthew Wilson who is travelling with us on this trip and myself set ourselves the feat of eating at Naples top three pizzeria’s. No mean feat considering we had just spent the day from 10am until 5pm with Moliettieri trying many different wines and eating so much food. 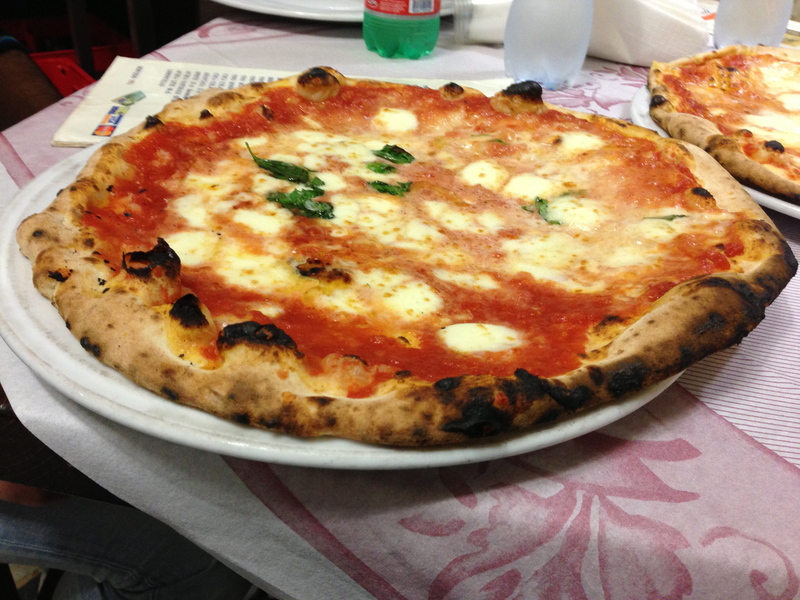 Not the most ideal preparation for a Naples pizza shakedown but what can you do…. 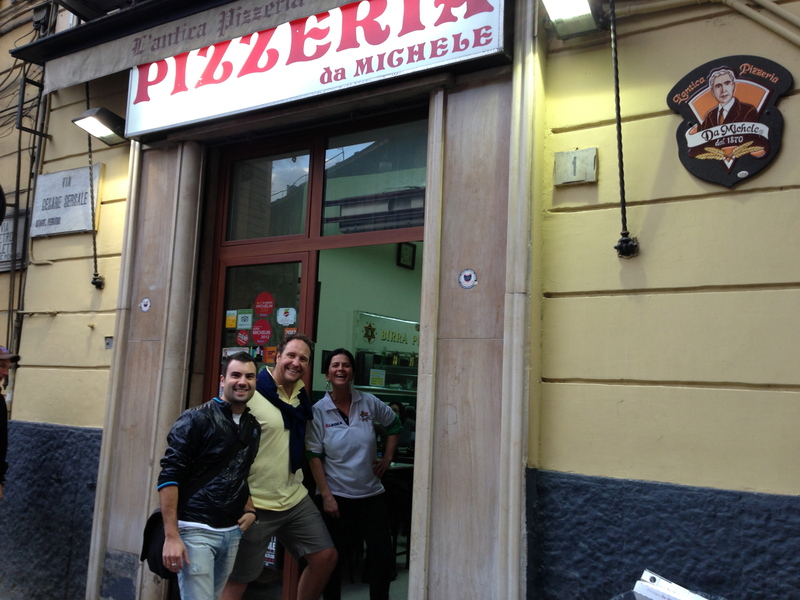 The first stop of Pizzeria da Michele recognised as the best Pizzeria in the world. In the last few years it has seen it’s reputation drop a little as it has been over run by tourists from around the world. 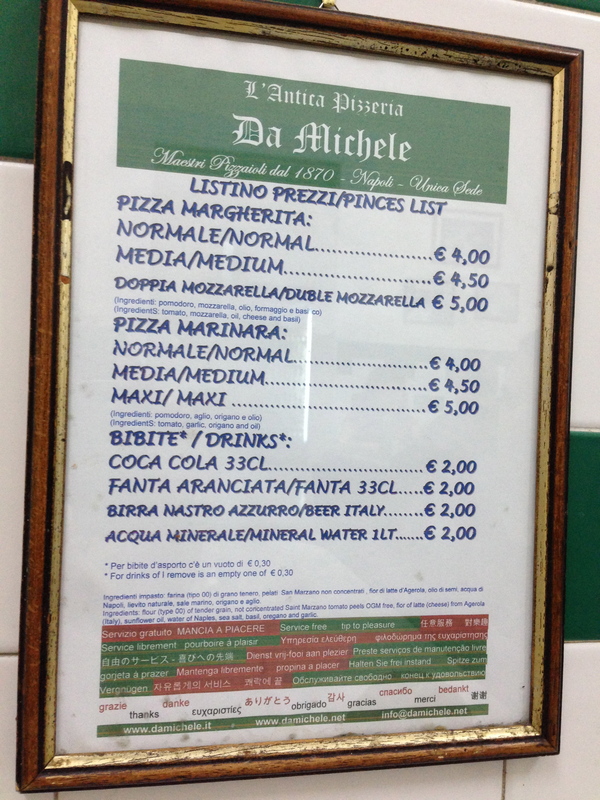 Pizzeria da Michelle does not offer a lot of choice: buy why would you want choice when you are eating the best Pizza in the world? 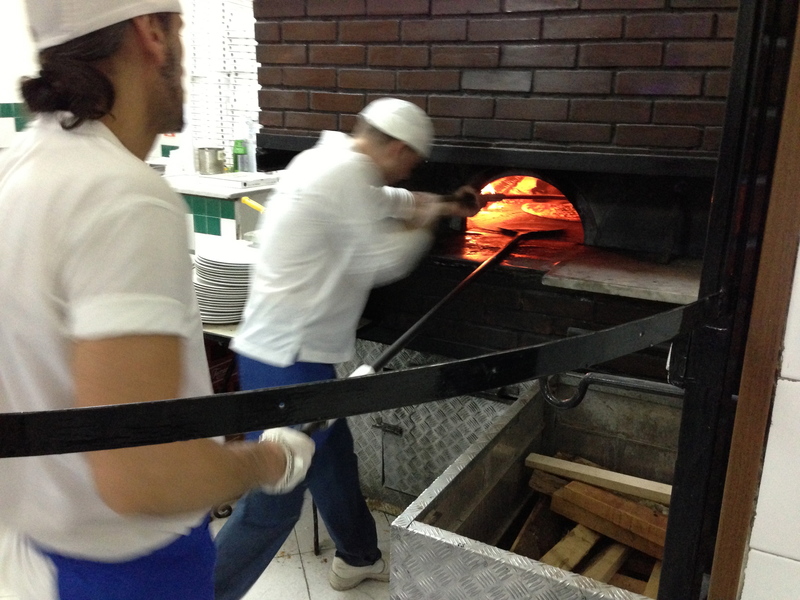 A constant team of pizzaiolo work the oven and just watching these guys in action was worth the visit to Naples. And the pizza? The best I have eaten in my life. The texture of the dough and overall taste was unbelievable. We just couldn’t believe how good it was. 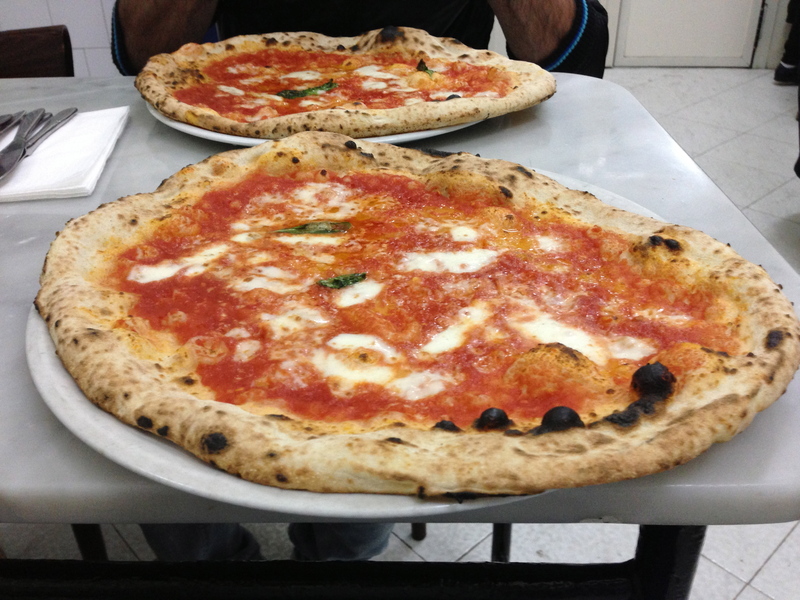 Second on our list was Pizzeria Sorbillo which is rated by many pizzaiolo as the best pizzeria in Naples. Our thoughts? 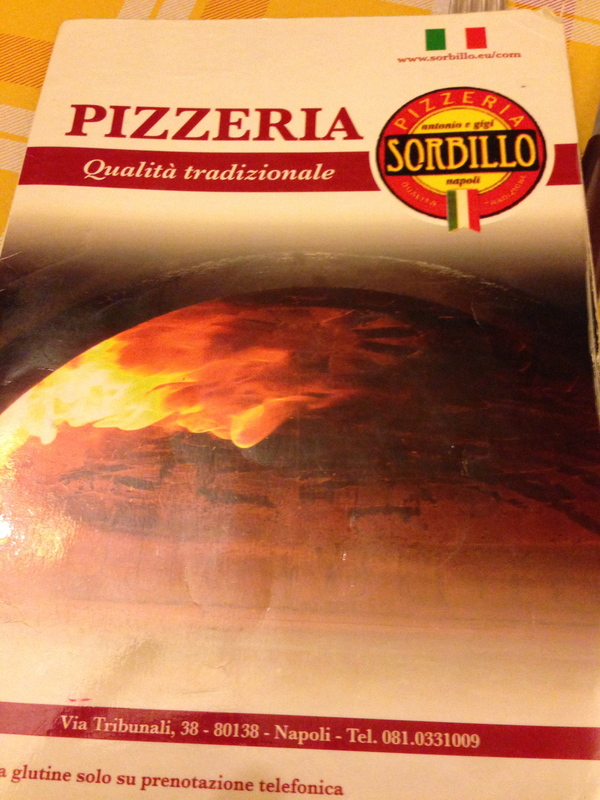 We thought it was good but not up to the level of Pizzeria da Michele. The quality of ingredients was just as good, with the main difference being the texture of the dough. And the final stop in our Pizza shakedown was Pizzeria Di Matteo. These guys use a Stefano Ferrara oven and the pizzaiolo even has a tattoo on his arm of his oven. Serious dedication I reckon!! And the pizza? Wow!! Just a smidgen behind Da Michelle and again the taste and texture was incredible. After eating seven pizza’s between three of us in the space of an hour I felt like I was going to explode. Last night I hosted a fantastic dinner for the Melbourne Food and Wine Society on Campania with my good friend Naz from Vinosita. We tried and talked through some great wines. Tonight I couldn’t help myself but go back to this baby. One of the wines that keeps my loving what I do and it everything I look for in Italian wine. Forza Campania and Salvatore. Forza Campania: a stunner from Nanni Cope…. 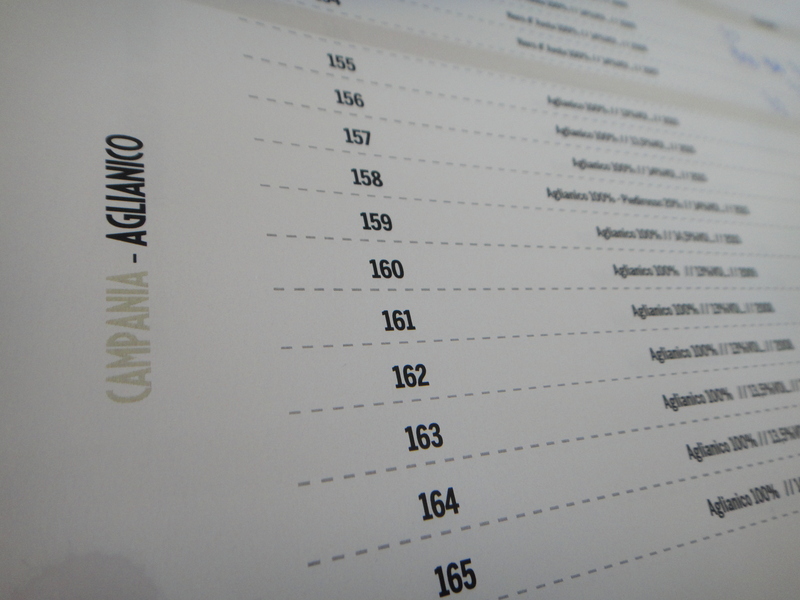 Over the next couple of months, Campania will be front and centre in my line of thinking. Next month I am presenting two dinners on Campania for the Melbourne Food and Wine Festival with good friend Naz Fazio and importer of this stunning wine. I am also heading to Campania in early April to visit the producers that we import via @mondoimports and also touch base with a growing band of friends who call Naples home. When it comes to native varieties in Southern Italy, Campania has been leading the charge since the early 1990’s. Recently it has been great to see other regions like Puglia, Calabria, Sicily and Basilicata follow suit and this is where my interest lies with these regions. I love native varieties grown in the region they originate in. The Nanni Cope TERRE DEL VOLTURNO IGT 2009 is exactly that wine and it is one of the best wines to come out of Campania for a very long time. This wine is a blend of Pallagrello Nero 85%, Aglianico 12% and Casavecchia 3% and shows how good the grape variety Pallagrello Nero can be. Whilst it has similarities to Aglianico, it is more feminine, delicate and structured slightly different on the palate. Awesome wine and a real highlight for the red wines of Campania. away, and the middle course of the Volturno river flows in the neighbourhood. Casavecchia from own centuries old ungrafted vinestocks, in the region of Pontelatone. surface management, and harvesting approaches. trying to discover and taste new things or enjoy the utmost emotion of a great wine. 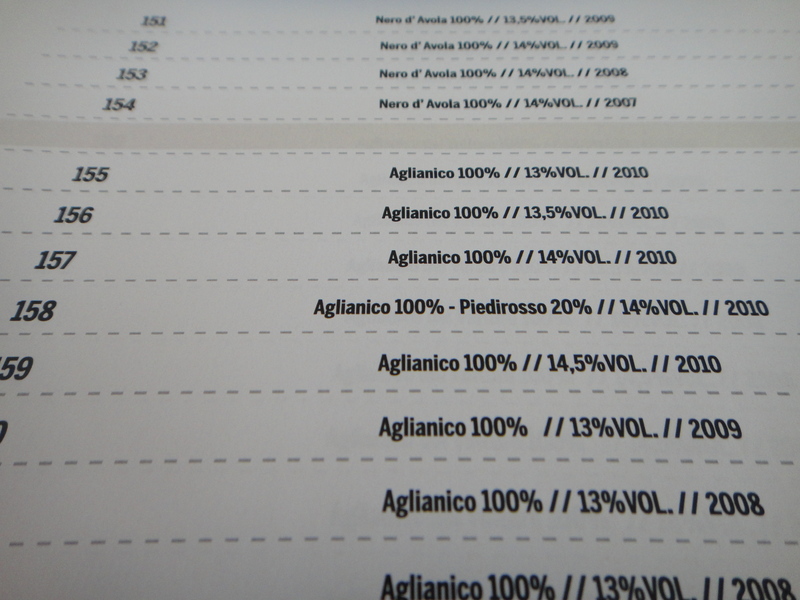 – Pallagrello Nero 85%, Aglianico (clones VCR 23-VCR11) 12%, Casavecchia 3%. Monticelli. Average age over 20 years. Varieties Pallagrello Nero and Aglianico. 2009 harvest: from September 26 to October 9. 2009 yield: 34 hl/ha (13,7 hl/ac). 2009 production: 7,500 750ml bottles and 120 Magnum bottles. Non reducing dry extract: 31,3 g/l. Collection: in cases of about 16 kg (35 lb) each. Yesterday afternoon was an interesting session at Radici del Sud 2012, it included for me the best wine I have tasted during the whole competition, but also a number of wines which underwhelmed. 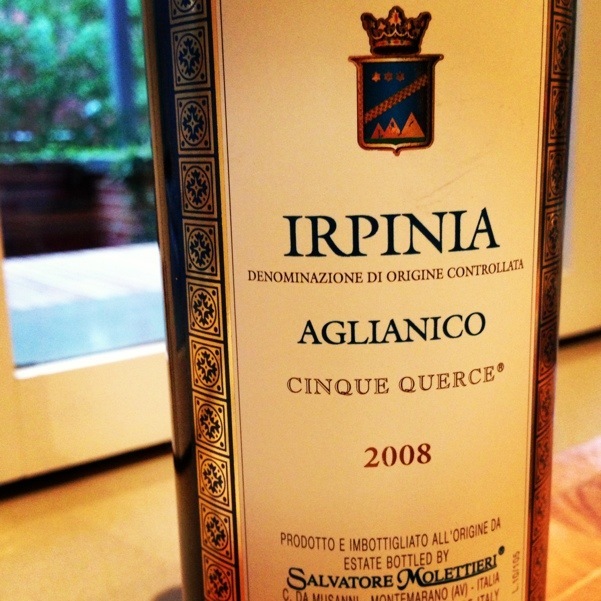 Aglianico is one of my favourite wine styles. When it is right, it makes some of the best wines on the planet. When it is smothered in oak, it becomes dull and boring, like so many new world wines that taste of coffee and vanilla. During the class of Aglianico’s yesterday, those producers that did get it right produced wonderful wines, that stood out like beacons compared to many of the other wines. It was interesting that for me, it was Aglianico del Vulture from Basilicata which were able to producer better, more variety correct wines than Campania. It seems there is an international influence on Campania which is hopefully a fad as it is robbing many wines of their indigenous style. In today’s final morning session we look at Taurasi so hopefully Aglianico from Campania can get back on track with this bracket. With all the judging sessions of Radici nearly finished, it has given many of the judges a fantastic insight of the wines of the south. The best examples are as good as any of the best wines made in the world today. However, as with any region that is just starting to make a name for itself, many producers are unsure what style they should be aiming for and in future it will be interesting if each region can as a whole, make wine that highlights the advantages of using native varieties. 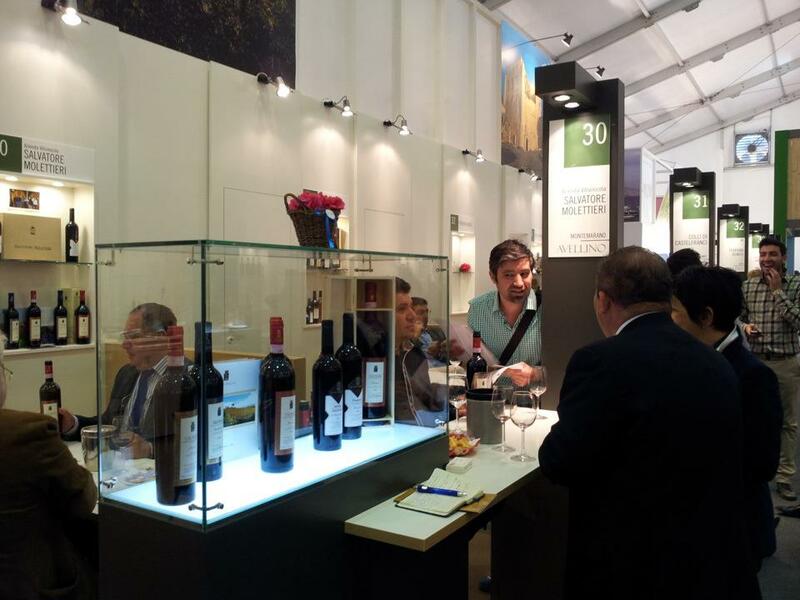 For me, it has not only been fantastic in trying so many diverse wines from the south, but also meeting so many people who are passionate about the wines of Italy and especially the wines of Campania, Basilicata, Puglia, Calabria and Sicily. With this much enthusiasm and knowledge, it is good to know that the south is in good hands. Today was one of the reasons why Vinitaly is so important for wine importers from places so far away like Australia: to be able to go from Calabria to Campania and finally Tuscany (Chianti Classico) all in one day was worth the 30 hours on a plane just for that. 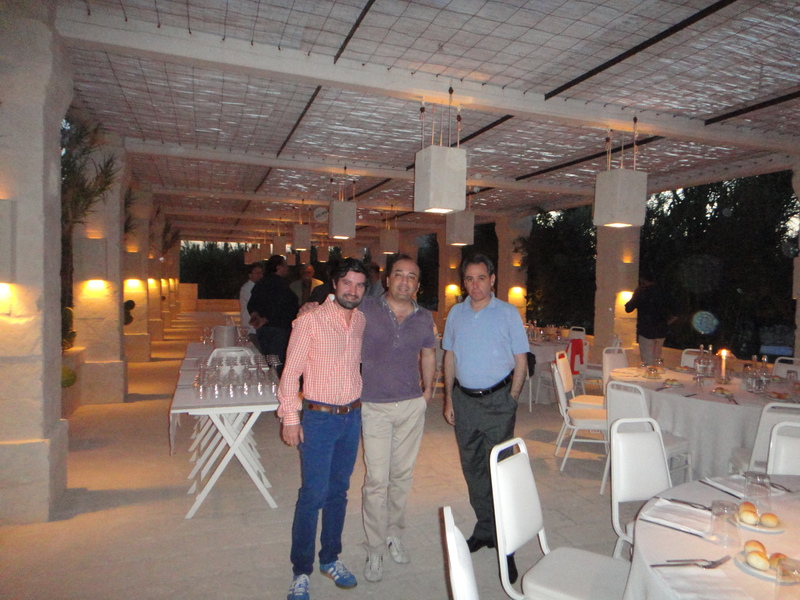 In Campania I visited our new producer for Mondo Imports, Salvatore Molettieri and tried through three vintages of each wine. I also had time to visit our Calabrian producer ‘Le Moire’ who makes a small of amount of wine with passion and dedication that I find quite inspiring. His 2011 vintages reds look fantastic and I can’t wait to show these wines in Australia. From their I moved to Tuscany and tried three a number of different Chianti Classico and Chianti Classico Riserva’s from all the benchmark producers that find their way to Australia. I loved the standard 2009 Chianti Classico and 2007 Chianti Riserva’s. These are stunning vintages for these two wines. 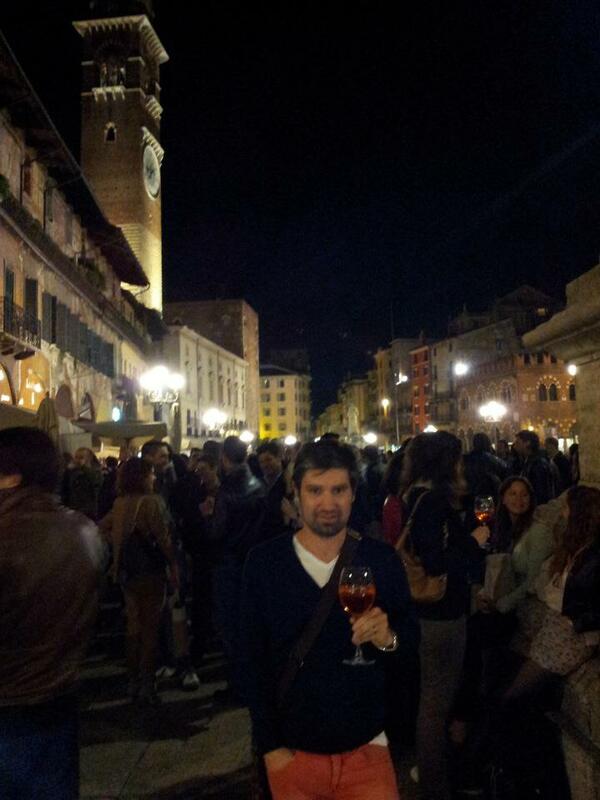 Tomorrow I will do Franciacorta and Brunello di Montalcino. For the last year I have been searching for a producer of Aglianico from Campania that would be a great fit for Mondo Imports. 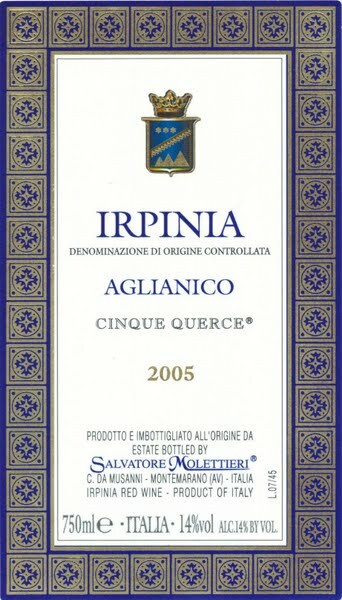 We already import Pipoli Aglianico from Basilicata which makes fantastic wines all for under $20 a bottle. Hence, when we looked to Campania, my aim was to look for the best producers of this variety. After reading and researching, the name of Salvatore Molettieri kept reappearing. Fast forward three months and we have agreed to start a collobaration for Australia with the first wines due here around the end of April. These are great wines, with some wine critics considering some of the best in the whole of Italy. 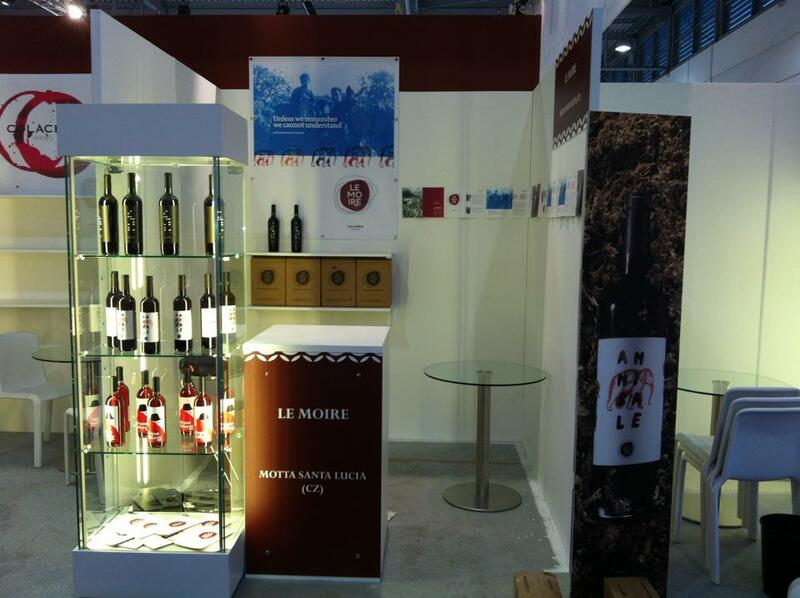 Below are some quotes that are listed on http://www.wine.com and give you a good understanding about Molettieri. “A new wave of wines from Campania that showcase how special the Aglianico grape can be.” – Robert Parker, Jr.
Molettieri is a practicing organic winery. Integrated insect and disease control is followed and copper and sulfur-based products are used in accordance with organic standards. Organic fertilizers, primarily manure, add nutritients to the soil. 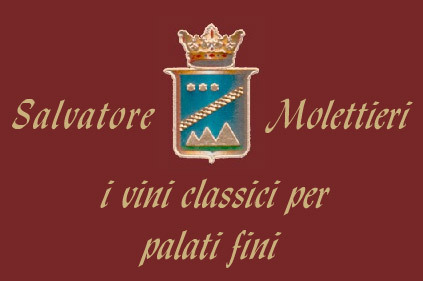 Molettieri uses no herbicides, fungicides or insecticides – the high altitude of the vineyards ensures breezy, dry air, making molds a rare occurance. Minimal doses of SO2 are added to the wines to ensure freshness and quality.